“There are a million different problems out there. Every single day in any urban city you walk by, there are people who are homeless, people who are sick. 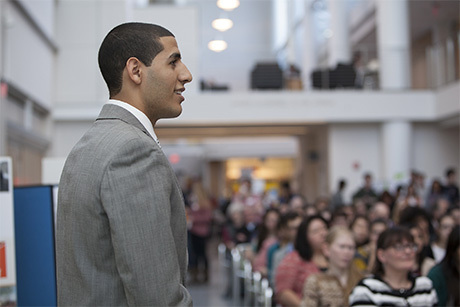 How do you know when you’ve identified the problem that you should be solving?” asked keynote speaker Karim Abouelnaga ’13 at the annual Service-Learning Showcase held on April 17. 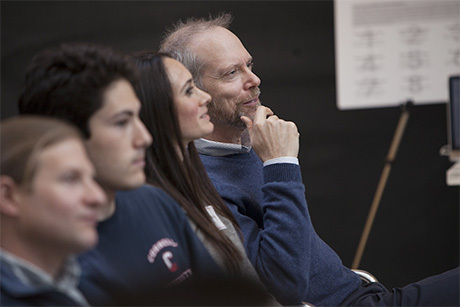 Karim, founder of the nonprofit Practice Makes Perfect, emphasized the importance of personal reflection in problem-solving and encouraged the nearly 200 faculty, staff and students in attendance to bridge the gap between their work at Cornell and their passion to make a difference. Abouelnaga’s address also celebrated those across campus devoted to public engagement locally, nationally and internationally. The address was followed by a ceremony for faculty and student project awards, co-sponsored by Engaged Learning + Research and the Office of Academic Diversity Initiatives. Winning projects received $1,500 to support future community-engagement initiatives; they were selected on their impact on the communities they serve, project sustainability and knowledge dissemination within the Cornell community and beyond. Kira Gidron ’13, a graduate student in the field of systems engineering, won the Student Excellence in Community-Engaged Learning + Research Award for her work with the Intag Project. The project is a long-term partnership that links community organizations in Intag, Ecuador, with Cornell students through coursework and close collaboration with on-the-ground community partners. As an experiential learning class, it aims to strengthen sustainable and socially just alternatives to open-pit mining in Ecuador through education, outreach and economic development. The Faculty Excellence in Community Collaboration Award went to professors Karl Pillemer, M. Carrington Reid and Elaine Wethington, who co-direct the Translational Research Institute on Pain in Later Life. The institute brings together dozens of outstanding faculty, staff, students and community partners to improve the health and well-being of older adults through non-pharmacological interventions for chronic pain. Now in its fifth year, the institute benefits communities across New York state and nationally. The showcase also featured several student projects from the Clinton Global Initiative University (CGI U) Annual Meeting and gave grants totaling $10,000 to outstanding projects. The top CGI U Commitment Award went to Scholars Working Ambitiously to Graduate (SWAG), a group led by students Kendrick Coq ’15, Channing McNeal ’15 and Thaddeus Talbot ’15. SWAG fosters a supportive environment at Cornell to increase black men’s graduation rate to 90 percent by 2015, putting the group on par with the graduation rate of other racial demographics on campus. Honorable mentions went to Alexon Grochowski ’15, Joseph Nelson ’14 and Ralph-Cedric Comeau ’16 for Inclusive School Haiti; Timothy Smith ’14 for The Bekondo Project; and Angela Han ’15 for Project STAR: Celebrating Women. The event also featured graduate student Meredith Ramirez Talusan’s “Keep Your Hat On” photography exhibit, which identifies Cornellians across disciplines that engage in social innovation and entrepreneurship. A total of 42 groups presented at the showcase. Scott Goldberg ’16 is a student intern writer for the Cornell Chronicle. Posted in Articles on the Web and tagged aging, awards on July 24, 2014 by ktb1@cornell.edu.